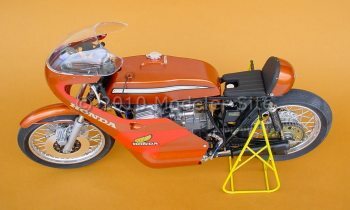 After building the Tamiya Honda RC166 I decided that this great bike needed company in my showcase and took out the Gunze (Mr. Hobby) Honda RC110 kit already waiting for a long time in my stash. This kit is sold out at the hobby shops but still available from time to time at a well known internet auction platform. 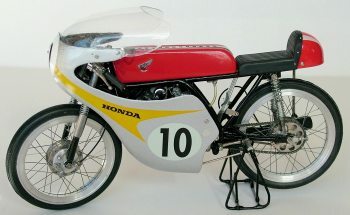 The Honda RC166 is the first historical racing bike of the 60’s that Tamiya ever made. 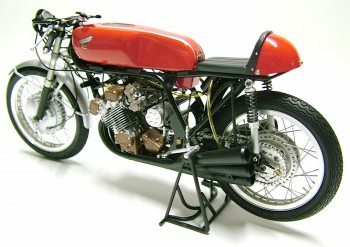 This era of racing was full of technical innovations and so the RC166 is a 250cc 6 cylinder 4 stroke engine with 4 valves per cylinder and double overhead camshafts.